One thing that every webmaster will agree on, is that traffic is the number 1 critical ingredient to a successful website. You can never get enough traffic. Despite what many people think, there is no magical formula to success, nowadays running adult sites are a numbers game. The more visitors you get, the more will sign up. 1 out of every 500 visitors sign up is good, but 100 out of 50,000 is even better. As a novice webmaster, you cannot just build your site and hope that people will magically find it. You need to get your hands dirty and consistently build streams of traffic. Fortunately, you are not alone. We have partnered with a number of companies that offer targeting traffic that can suit all of your needs, whether its buying traffic for your site, or selling ad space on your websites. 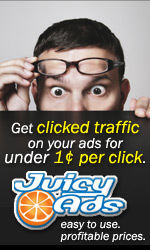 Display banners on your site in exchange for free exposure on other sites within the program. Review sites for adult traffic. Everything to do with MGP and TGP galleries.